The file, in excel format, handles up to 11 months of corporate financial planning and is able to simultaneously manage the cash flows up to 6 stores. It's in xlsb format which is supported by MS Office 2007 and later versions. The price refers to the license for use for 9 years of the software for 1 user. WITH 6 POINTS OF SALE. 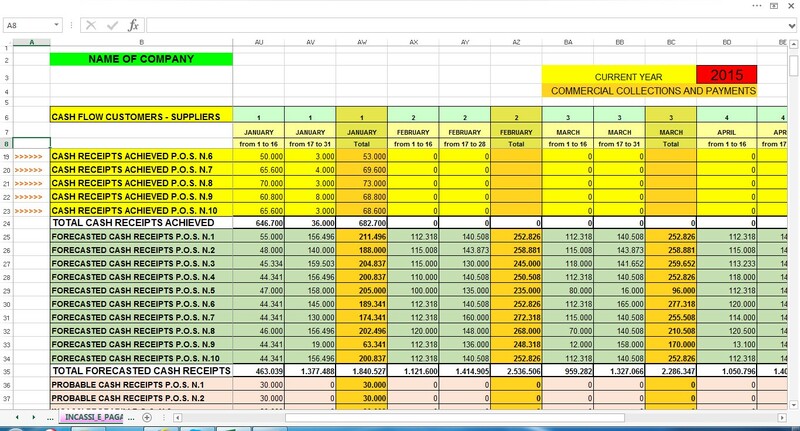 The workbook shown on this page is in Excel format and is a simple and easy tool to use for managing the cash flows of a company of the large-scale distribution. It may be useful to companies that sell retail through a network of supermarkets or hypermarkets, such as in the food sector. But it can be useful also to companies that sell others products for example: technology products, clothing, accessories, and more using a network of outlets or other chains of intermediaries of various kinds. In the site is showed, in short, a model to be used for the planning of the cash flows of large retail companies that manage up to 6 points of sale, making use of the integration of global financial flows of the company and of those of each store of retail. The document contains thousands of formulas and it is complete, dynamic, flexible and easy to use. The images illustrated below are only indicative and do not represent, in a comprehensive way, the entire functioning of the file. The file includes, in addition to the normal financial management of forecast of the company, also the financial management of forecast of 6 supermarkets or hypermarkets or , however, of 6 retail outlets. 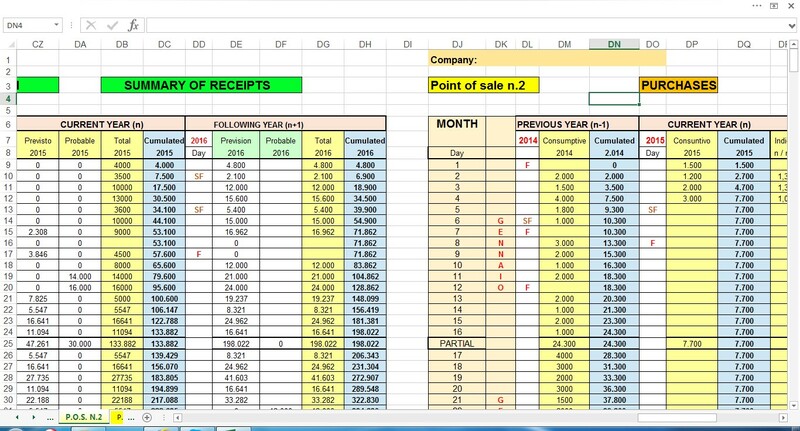 and, for each point of sale, it has been expected an summary management daily and monthly of all cash receipts. These financial flow entries can be renamed by the user. The file contemplates also the management of financial planning of the purchases. 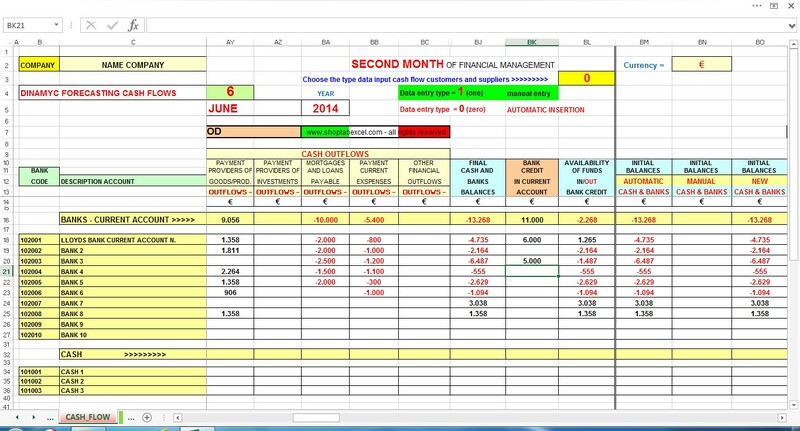 The cash flow from customers and suppliers for the first month is handled manually. The financial planning of the second month may be, instead, managed either automatically or manually. The initial cash balances of each period of financial management are proposed automatically but can be changed manually by the user. Of course, changing or inserting new data will result in the modification, at waterfall, of all other related data. This is the picture of one of the 11 reference tables. 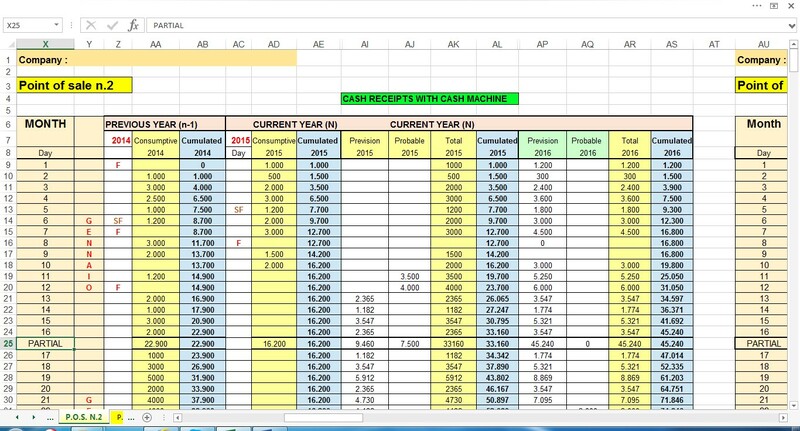 As you can note, the data of the first part of this summary sheet of the commercial cash flows come automatically by the analytic cash flow of each store. 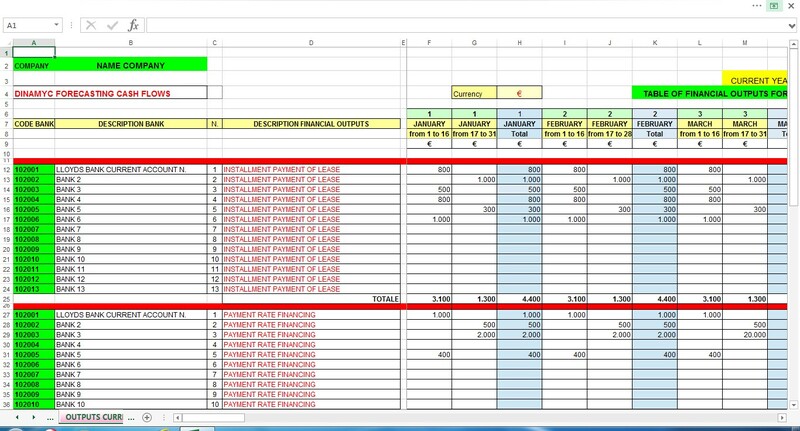 Once you set all the necessary parameters, the user will not have to do anything but update each month the value of sales and the value of purchases actual with those probable or forecasted and launch the elaboration of the commercial cash flows.